In the United States, we celebrated Thanksgiving last week with family, food, and football. Our family hosted guests for two nights, then visited out of town family for two more nights. While our guests were with us, I didn’t have much time for any of my usual making; I was too busy cooking, cleaning, and visiting. But I spent about 10 hours as a passenger on our way to and from another town, which allowed me to make up for lost time. A few weeks ago, we travelled out of state to attend a wedding. Since we don’t have any local yarn shops near us, I took the opportunity to splurge on a skein of Dream in Color Smooshy in colorway 43 Boot Camp and four skeins of Plymouth Yarn Reserve Sport in colorway 306 Mauve Mix. I’ve purchased both brands in the past and could have easily ordered them online, but it makes such a difference to me to be able to touch the yarns and see them in person when I can. The Reserve Sport is a soft blend of 45% wool, 35% silk, and 20% rayon from bamboo. The colors range from light to medium lavender, with touches of ivory and beige. I thought it would be perfect for a top, and chose the #07 Diamond Peplum Pullover pattern by Jill Wright from the Holiday 2012 issue of Vogue Knitting. I love the classic look of the sweater. In order to match the gauge, I’m knitting on US-3 (3.25 mm) and US-6 (4.0 mm) needles rather than the needles specified in the pattern. So far, the pattern is straightforward and works up quickly. Errata is available for one misprint. I had the ribbing for the back finished before we set out. During the drive, I was able to finish the back and knit almost half of the ribbing for the front. I’ve added an inch (2.5 cm) to the length. As much as I love the diamond pattern, I don’t plan to include the peplum in my version of this pullover. I also have some adjustments in mind for the sleeves. If all goes well, I’ll be wearing this sweater by our next family gathering in a month’s time. What are your making goals during this busy holiday season? What gorgeous yarn, such sheen. It will be perfect for the pattern. 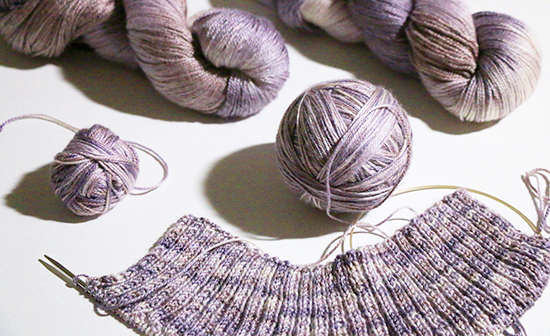 Yes, the yarn is gorgeous — it’s even prettier in person than in these photos! I don’t usually gravitate toward purples, but once I picked it up I couldn’t put it down.